A subway train was set on fire with gasoline, destroying two trains and causing large casualties of 192 deaths and 148 injuries at Jungangno Station. Fire Resistance: No fire protection. No sprinklers at platform level. Daegu (also known as Taegu) is an inland city located about 300 km southeast from Seoul, the capital of South Korea. The Daegu Metropolitan Subway Line No. 1 has an operational distance of 25.9 km between Daegok and Ansim with 30 stations. In total, the line has 4.15 km long of bored tunnel and 23.45 km long of box section constructed by the cut-and-cover method. – Basement B1 (floor area = 3847 m2) contains the concourse. An underground shopping mall perpendicular to the station is extended into the central section of the basement. – Basement B2 (4586 m2) contains the concourse and office room. – Basement B3 (2004 m2) was the fire floor and contains two platforms of 169 m long with two tracks in between. On 18 February 2003, a subway train was set on fire by a mentally ill patient at Jungangno Station in Daegu, South Korea. The fire quickly spread to all six coaches of the train within 2 minutes due to the highly flammable interior of the train. The seats, flooring and advertisement boards were not made of fire proof materials but composed of flammable fiberglass, carbonated vinyl and polyethylene. The fire had also spread to another train in the opposite direction which stopped alongside, killing all the passengers trapped in it. The complete burning of a total of 12 subway coaches generated intense heat and poisonous smoke filled the entire station. The platform had no sprinklers and no one attempted to fight the fire. The temperature of the platform on Basement B3 quickly raised over 1000oC, burning down the facilities, signposts and ceiling of the platform. The fire then spread to the B2 concourse and the ticket punching stand. In the early minutes after the fire ignition, the fire detection systems had shut down the power supply in the station and closed down all smoke barriers at B1 and B2. The fire shutters installed at the entrance of the shopping mall passage at B1 was also closed. Ironically, this compartmentation effectively worked to concentrate the heat and smoke at the central section of B2, causing large casualties (see Figure 1). A total of 192 people died and another 148 people were injured in the fire. Train 1079 from Banwoldang Station stopped at Jungangno Station. Before the train entered the station, a mentally ill man, 56, had set a fire on the fifth coach with two cartons of gasoline, about 4 litres, with the intention of committing suicide. The arsonist escaped along with many passengers when the train stopped at the station. The fire alarm was activated but ignored by the officials in the Machine and Equipment Control Centre. The fire rapidly spread to all six coaches within 2 minutes. Train 1080 in the opposite direction left Daegu Station and headed towards Jungangno Station. Train 1080 stopped alongside Train 1079 which was on fire, about 1.3 m away. The platform level was full of smoke from the fire of Train 1079. The doors of Train 1080 opened briefly and closed immediately by the driver to prevent the smoke coming into the coaches. Power supply to Train 1080 was shut down by fire detection system. The driver of Train 1080 was waiting for re-supply of power and the order of his superior, not letting the passengers to evacuate. The driver fled the train without opening the doors of passenger coaches. 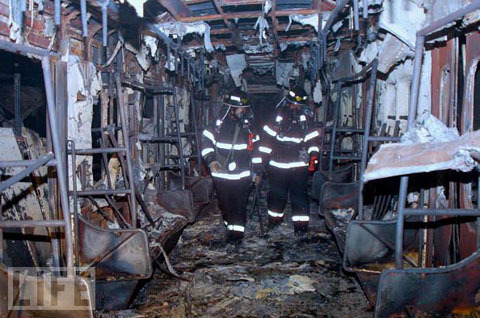 The fire spread to the train and consequently killed 79 passengers who were trapped. The fire was extinguished. However, because of the toxic smoke, the rescue was commenced around 15:30 hours to recover the dead bodies. The subway station did not suffer major structural damage in the fire except for the extensive spalling of the tunnel roof above the central portion of Train 1080, exposing two layers of steel reinforcement. The non-structural damage included the complete destruction of the platform basement and the smoke contamination throughout the station. In addition, two subway trains with a total of 12 passenger coaches were completed destroyed. It was an unusual practice to allow easily flammable materials for the interior of mass rapid transit vehicles. The flammable seats and flooring in the Daegu Subway trains led to a very rapid of fire growth and fire spread. The dense dark and poisonous smoke generated by the burning of the plastic materials blocked the escape way of the victims, incapacitated their mobility and ultimately a lot of them suffocated. The worse part is that the emergency and fire control systems of the subway station did not work properly at the time of the fire. The inquiry into the fire event showed that the key control officials of the station were guilty of professional negligence. Little information was available in the public domain on how the emergency and fire control systems worked during the fire. However, the general responses showed that the station lacked emergency lighting, the ventilation system was inadequate and the sprinklers did not function. This event highlighted the importance of enough safety training of the operators of public transports. After this tragedy, the Korean government promised to enhance the fire safety to all subway systems in the country. All passenger trains must use fire proof material in the interiors. However, it was reported that, except the Daegu Subway, the replacement of the flammable interiors to fire proof materials progressed slowly in other subway systems in Korea due to the budget constraints. National Emergency Management Agency (2004). “Fire in Daegu Subway.” Disaster Reports – Online, South Korea. Tsujimoto, M. (2003). “Issues raised by the recent subway fire in South Korea.” ICUS/INCEDE Newsletter, 3(2), Institute of Industrial Science, The University of Tokyo, pp 1-3.